Share Raspberry Pi’s Wifi internet to Ethernet. This tutorial will turn Raspberry Pi to your personalized router. It translate the internet connection you get maybe from hotel’s wifi internet to your Raspberry pi network. The Raspberry Pi also have DHCP activated. Video Tutorial is also available for easy understanding. We have to assign a static IP 192.168.1.1 for Raspberry Pi Ethernet adapter. We will install & configure the DHCP service so your Raspberry Pi will automatically assign IP for every device plugged in the Ethernet Port. Lets install Open SSH so we can use Putty in step 4. Ensure your Laptop Ethernet adapter setting is set to auto obtain IP address. Plug your Ethernet cable to your Raspberry Pi and the other end to your Laptop Ethernet port. Your Laptop should get IP address assigned by your Raspberry Pi. 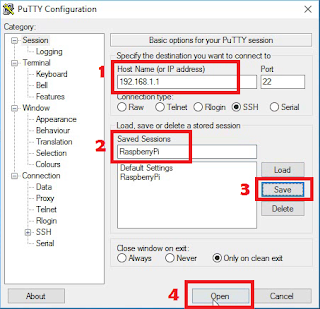 Now open Putty and type 192.168.1.1(Raspberry Pi IP Address) in Host Name, type any name you like in Save Sessions. Click Save and finally click Open. In this step, we will configure the Wifi setting for the Raspberry to be able to connect to a wifi network. Useful tip: You can just copy codes from your browser and paste it to putty by pressing right click of your mouse inside the putty window. Paste this code at the end of the line. ssid="***HERE IS YOUR WIFI ID***"
psk="***HERE IS THE WIFI PASSWORD**"
We have to forward the internet connection we got from Wifi to the Ethernet port where our laptop is connected. echo "Resetting the IP Tables"
Lets make this rules loaded automatically every time the system reboot. Let check if this works. 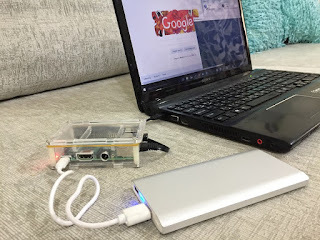 Ensure your Raspberry pi is connected to your laptop Ethernet port and Raspberry pi is connected to a Wifi that has internet. Disconnect your laptop from any Wifi connection. Then browse any website and see if it works. If Raspberry Pi and Router has the same IP address, it will not work. Also only one Dhcp service should run in a network. So ensure the router has no Dhcp running. Remember we configured the Raspberry Pi Dhcp service.